One sound the Orange-winged Amazon makes resembles the Black-headed Gull. 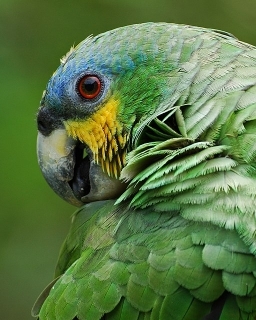 A.a. amazonica: Both adults forehead, crown and forecheeks yellow; lores and band between eyes violet/blue; throat yellow/green tinged with blue; orange bases of secondary feathers 1 to 3, the remainder green tipped with blue; central tail feathers green, side tail feathers green tipped yellow/green, the orange/red on inner webs of wings banded in centre with dark green and with red at bases of feathers. Bill horn coloured with dark grey near tip. Eye ring grey/white, eye orange. A.a. tobagensis: Both adults differ from amazonica by having more extensive orange bases to the secondary feathers 1 to 4. As in adults but with grey/white eye ring, eye grey/brown. Wide variety of sounds. Harsh screeches, screams, squawks, trills, bubbles and whistles. Fruit such as: apple, pear, orange, cactus fruits, pomegranate, etc, forming about 30 percent of diet; vegetables such as: carrots, celery, green peas and beans, corn; green leaves such as: Swiss chard, lettuce, dandelion; spray millet, small seed mixture low on oily and sunflower seeds; cooked beans and pulses, and complete kibble. Provide lots of bird-safe wood and leather chew toys, puzzle toys, food foraging toys, swings, ladders; bathing and companionship. Heavily trapped for the wild-bird trade: well over 300,000 wild-caught individuals have been recorded in international trade since 1981. Is also hunted for food, and habitat loss is a concern. May benefit when land clearance leaves a mosaic landscape. A.a. amazonica: N and E Colombia to N Venezuela, including Isla Margarita and south of Rio Orinoco throughout Amazonas and Bolivar, and the Guianas and Amazon River basin, south in Brazil to Mato Grosso, W Sao Paulo and N Parana, and E Bolivia, to E Ecuador and E Peru; occasionally in coastal Brazil, from Pernambuco south to NE Sao Paulo. A.a. tobagensis: Trinidad and Tobago. Utilizes all kinds of lowland forest and wooded country, near water, including tropical rainforest, savanna and other seasonal woodlands, cultivated areas with trees, mangroves, vareza forest and gallery woodlands. Mostly below 600m (1968 ft) but up to 1200m (3936 ft). Eats palm fruits (Sloanea, Richeria and Byrsonima), flowers of Erythrina, other food plants. May take oranges and mango in cultivated areas when other food is scarce. Likes to be near water; roosts communally in clumps of trees, giant bamboos or palms. Several pairs combine in loose flocks with groups up to 50 individuals quite common and 200 or more not unusual. May also visit urban areas. 3 or 4 elliptical to ovate eggs, 37.5 x 29.0mm (1.5 x 1.1 in). January-June, Trinidad and Tobago; December-February, Magdalena Valley.